Using checkboxes for controlling Filtering of your Dynamic collection has its own benefits and allows you to create a "combined filtering" (it is not a multi-dimensional filtering). It can be setup with two different type of filtering logic. "OR" logic - show all items that belongs to one category OR another. For example, selecting both Filter 1 and Filter 2 checkboxes would all show items that have category "Filter 1" OR "Filter 2". Important: With each next selected checkbox filter will show items that have at least one of selected categories. "AND" logic - show only items that belongs to one category AND another category at the same time. For example, selecting checkboxes Small an Sunlight will only show items that has category "Small" AND "Sunlight" applied to it. Important: With each next selected checkbox filter will look for the items with all selected categories applied at the same time. After container with Dynamic Items was created and all necessary classes (for filtering and sorting) were applied we can start building our Controls. For being able to use checkbox elements we have to put them inside the Form. Note: Process of creating controls for both types of logic (OR or AND) is similar. Add checkboxes with .filter_check class. Number of checkboxes should be equal numbers of filtering categories we have, plus one more for "All" option. All checkboxes will have a values that are equal to a classes created from a filtering category and applied to the mix-items. 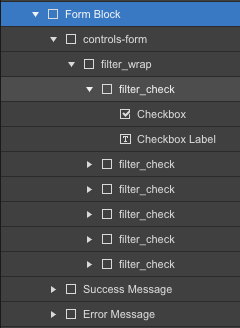 MixitUp will read values from the "checked" checkboxes and create a certain filter based on a type of selected logic. By default, Webflow doesn't have a "value" option for checkboxes. 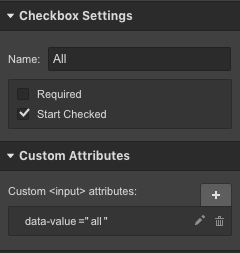 But we can apply a custom attribute data-value to each checkbox input element that represents a filtering category. Later we will "transform" them into a standard CSS attributes. Important: Values of these custom attributes should look like a classname in CSS format (with "dot"). 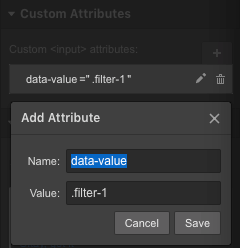 For the checkbox with option "All", set the data-value custom attribute equal all (without "dot") and set the option "Start Checked" as active. Custom code for this type of controls look most complicated, but if imaginary divide it into 4 parts it will be not so scary. In 1st part we define our container for filtering, filter_wrap where all our checkboxes then specifying which exact elements (inputs) has values for filters. Important: if you created checkbox structure by by embedding HTML code to the page, you do not need this part. ‍2nd part, similar to the Example with using radiobuttons for controls, will bind a 'change' event to our checkboxes. It also handling check/uncheck functionality for the option "All": when any of categories is selected option "All" will be unchecked automatically, and if option "All" was selected then all other checkboxes will be unchecked. var selectorString = selectors.length > 0 ? Now we will include link to the MixitUp3 library and all our code snippets inside the <script> tags before the closing </body> tag into the page custom code area.